Hello! 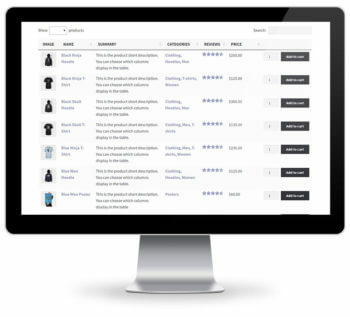 Yesterday, we introduced you to our bestselling plugin: WooCommerce Product Table. This plugin helps increase the conversion rate of your WooCommerce store. Today, we want to share more insight into overcoming the barriers affecting your conversion rate. We’ll show you how more than 3,500 e-commerce shop owners, just like you, have boosted their sales with WooCommerce Product Table. WooCommerce Product Table helps you sell more products by letting you display as many products as you like in one easy to navigate table. This lets customers quickly sort to find the products they want – and helps you sell more, just as John did. If you need help, we’re here for you: we understand you’ll occasionally need help, and we’re on hand to promptly and efficiently get your issues fixed. You can read dozens more reviews just like these on the WooCommerce Product Table reviews page. Read the full list of reviews, or search for reviews about your exact use case. We’ve also published a plugin showcase, where you can see real-life examples of other WooCommerce stores who have improved their conversion rates. Can we boost your conversion rate, and make your customers happier? Now that you’ve heard how other WooCommerce store owners have benefited from our plugin, are you ready to join them? WooCommerce Product Table comes with regular updates and personal support for 1 year. We think you’re going to love how quick and easy it is to setup and customize. The easy way to grow your WooCommerce store's conversion rates. I like to have a list of 50 products. But each purchase must have a minimum of ten items - or alternatively be exactly 10 items, Is that programmable with this plugin? Hi Akili, I recommend that you use the official Min/Max Quantities plugin for this. It works nicely with WooCommerce Product Table.